I'm sooooo tired. 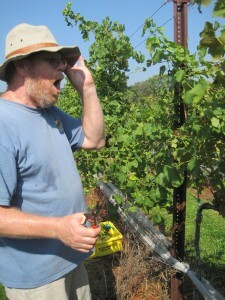 You think picking grapes is easy? Okay, then, you try it. that we spent a lot of time staring at the vines, wanting to be sure that we didn’t add bad fruit to the lugs or leave good fruit on the ground. In any event, we were working on half a section of Viognier that day. Kirsty had told us that they picked the first half a week earlier, due to advanced ripening at the top of the hill and indications that sour rot was starting to set in. Since it was clear that rain was on the way, Blenheim picked the first section which had ripened early, and let the rest hang on in the hope that it would continue to gain sugar and flavor. The two types of rots that appeared on the grapes in the second section – Botrytis and sour rot – both make grapes mushy (both leak juice with a vinegary odor), and so by the time they would have made it back to the sorting table, they would have leaked all over he good fruit. We weren't very fast, but the fruit we added to the lugs sure looked good! Can't wait to taast the wine. 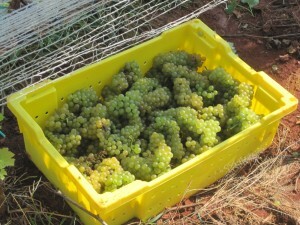 2011 Viognier. You can see from the pictures in my last post how small lugs are. They are meant to bring grapes back to the crush pad or sorting table in good condition, without the weight of too many clusters at the top crushing those on the bottom. Blenhein has almost completed its harvest. It has a small amount of Cab Franc remaining to be picked at the vineyard, and a few varieties in the Shenandoah Valley vineyards that it sources grapes from. You can bet that every winemaker and every vineyard manager will be glad to have all their fruit off the vine and into the fermentation tanks. It’s been that kind of year. “This vintage has been the most challenging one of my career in Virginia,” said Kirsty. I think that almost every vineyard in the Commonwealth – and probably a good many in California as well – would agree.